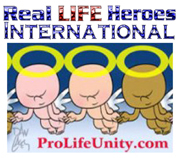 Pro-Life Unity Radio Live Right Now! Pro-Life Unity Welcomes Shelly Allsup! Shelley joins Pro-Life Unity as our Producer and Media Director. She will not only help make sure PLU media gets out on time, she will also be co-anchoring with Peter Shinn during the week in a new segment called 'The Pro-Life Guys'. Did you hear the latest Pro-Life Unity Radio show?! Guests in this show included Jonathan Benitez, co-director of the 2009 Defend Life Face the Truth Tour and his partner Angela Swagler, another co-director. As usual, many great topics were covered in this show, including issues of life and liberty! Should the March for Life control who marches under their banner? The March for Life in Washington D.C. is hosted by the March for Life Education and Defense Fund. They secure the permits and have the right to allow or deny any group from participating in the annual march which seeks to end decriminalized abortion in America. Click here to hear the president of PLAGAL (Pro-Life Alliance of Gays and Lesbians) make her case. And then come back to vote! Click here to view our page and to listen live! Is the Pro-Life movement to blame for Tiller’s death? This topic along with many others were discussed during the weekly broadcast of Pro-Life Unity Radio. Click here to listen to the show which featured Peter Shinn, Michael Hargadon, Mike Crone and Daria Monroe.